When creating your HOA agenda, consider the order in which topics need to be discussed. It’s best to start off with old matters that are still applicable to the present meeting before moving onto new business. Sometimes old topics play a role with current items, and it’s easier to lead with old news in case you looking to approve a matter that relates to old business. 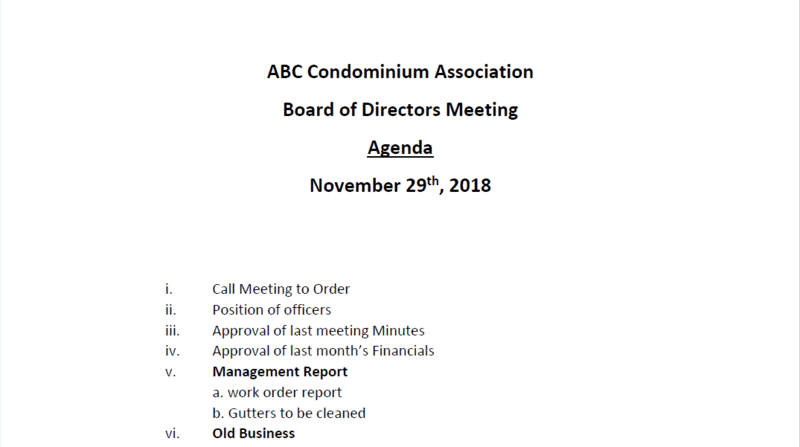 Here’s an HOA meeting agenda template with examples included. You also want to be mindful of matters that are only to be discussed in the executive session. These can be sensitive topics and could pertain to owner delinquencies, financial business, or sensitive topics so you’ll want to save those issues for later. Following HOA board meeting protocol is the most important thing to do when going through your agenda items. Protocol helps boards maintain order by using the approved method when handling motions. Outlined below are the six steps for HOA board meeting protocol when handling motions. In some cases, the board may call an executive session to discuss information that is either private or privileged. When listing the executive session on the HOA agenda, it is not necessary to include details due to the private nature of the conversation. Simply list the session as an item so the public knows when the open meeting has concluded and inform people the remainder of the meeting will be closed off to everyone except board members.